Misconceptions are sticky things. Like dried thistles adhering to your clothing as you walk through the woods, you acquire them without notice. And the longer you carry them around, the more they seem to affix themselves. Misconception about viticulture are similar. I picked up a few without notice. And as I carried them around, they became fixated --- accepted as logical enough so as to be true. I should know better. 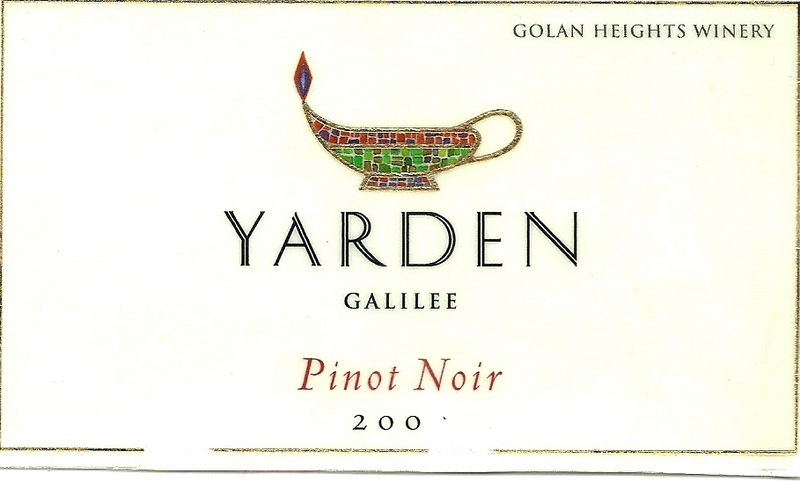 Then I received an invite to taste wines from Israel, specifically those made under the Yardin label of the Golan Heights Winery. I often taste wines and have tasted wines from all the countries that immediately come to mind and several from those that do not. I knew too that Israel produced wine, but Israel didn’t have the climate for quality viticulture: too hot, dry, arid and desert like. And “kosher” wine? We all remember those brands. That and one or two other misconceptions I’m embarrassed to admit having sticking to me were quickly self-realized once I tasted Yardin wine. As in Italy, and other areas, elevation is one key to quality viticulture. So is soil. And the Golan Heights offers both in the type for quality viniculture. Finally, having tasted the wines, and freeing myself from these misconceptions, I’ve become a self-appointed publicist. Without going into geographical detail (more to hide my ignorance than to risk boring you) the earth’s tectonic plates are constantly shifting and have done so for millennia. The Golan Heights (you’d think “heights” would have been a clue wouldn’t you?) is a volcanic plateau with varied and distinct soil types. Vineyards on the Heights are chosen based on elevation, aspect, and soil type and are among the coolest in Israel. Vineyards range from the Sea of Galilee to Mount Hermon reaching up to 3,900 feet. Golan Heights Winery cultivates 1500 acers of vineyards here, dividing the vineyards into 400 blocks. The tasting began with a Yarden Blanc de Blanc (2008) sparkling wine. 100% Chardonnay from grapes grown at high elevation in the most northern and coldest region of Israel. Lemon zest, tart green apple, and (for me) some white pepper on the nose. Citrus and minerality on the palate, from soils of basalt, clay and limestone. The mousse was fine and persistent and the wine was creamy with mild autolytic notes. No surprise it was made according to the traditional method: whole cluster pressing, secondary fermentation in the bottle. Disgorging began after more than five years of bottle aging on the yeast. All this for a suggested retail price of $32? I was interested. What followed was a 2014 Yarden “Odem” (organic) Chardonnay (100% Chardonnay), rich, balanced with caramel and deep lemon colored with notes of pie crust, smoky oak and a rich texture, it comes from the single vineyard. If that’s not your style of choice, consider the 2013 Yarden Chardonnay, a blend of pure Chardonnay and very much like a white burgundy. I found it graceful and finessed with balanced creamy notes played opposing tart citrus in aromas of orange. The blend benefits from full lees contact making the mouthfeel rich but is only partially subjected to malolactic fermentation, keeping fruit fresh. Aged seven months in French oak (50% new) the oak is present but unobtrusive. At an ARP of $22, this is a great value and struck my “happy spot”. I’ve since bought it at retail. We then moved on to a wine that completely cleansed me of my misconceptions: Yarden 2T (vintage 2012). The only problem I have with this wine is the difficulty I encountered in finding it at retail. It’s a blend of 50% Touriga Nacional and 50% Tinto Cao. Its somewhat herbaceous nose opens to a joy of Portuguese fruit: blueberry, plum, ripe berries, vanilla and nutmeg in a wine with bright acidity and violet. Married with Tinto Cao, the blend picks up floral notes, spice and enough tannin to make the wine age worthy. These are the grapes used in making port, but through the skill of winemaker Victor Schoenfeld, are made into still, dry, red wine that intrigues and captivates. Cocoa, spice, white flowers and oak. I absolutely fell in love with this wine. From Israel? Yes, and wonderful. We finished with a 2012 Yarden Cabernet Sauvignon. Lots of bright notes, I enjoyed its old world style of restrained fruit that developed with airing. ARP $32, I wanted to play more with this, initially thinking it might contain some Cabernet Franc (it does not) and whether it was grown in a cooler site, as the fruit was not California fruit-forward in style. Aged 18 months in French Oak (40% new) I enjoyed blackberry layered with spice and some earthy notes all balanced seamlessly. This wine can age easily 10 more years and I’d like to be able to taste it then and enjoy how those bright notes have moved with time. wine by myself and found a 2011 Pinot Noir. If I could be convinced by this challenging wine, then I’d be committed to being a fan. I’m now a fan! Unusual and interesting, the nose offered dried herbs, eucalyptus and pencil shavings with flavor of black cherry and cola but true to its varietal character. A shade “new world” in color, it was nonetheless fruit restrained. On the second day, the wine lost no character, still offering black cherry but now combined with sweet cherry. Its nose promoted more complex black licorice. It had a medium finish with soft tannins and great balance. Winemaker Victor Schoenfeld graduated from the University of California (Davis) in 1988 with a degree in Enology. He spent time at Robert Mondavi, Chateau St Jean and Sonoma’s Preston Vineyards and joined Jacquesson & Fils (the 200-year-old Champagne house) before arriving at Golan Heights Winery in 1991. Committed to the application of new technology, Schoenfeld is regarded as one of Israel’s most influential winemakers and has developed sophisticated viticultural analysis in the belief that knowing exact soil type, climatic conditions, variety, clone and rootstock are essential to making quality wines in a “new” region. New technology, old soil and premium wine have resulted. Follow Wine Mizer on FaceBook for mini-review of wine, industry news, recipes, fun facts and more. thanks. appreciate the link. Just getting caught up. No worries. In fact, I appreciate you having checked it out.